There is something about ski terrain that requires a little more effort to access. Usually its the better snow conditions and fewer people that draw you there. I do think there is something about the hike itself that adds to it. The Mirkwood hike-to terrain located just off the Breezeway Lift is some of my favorite terrain at Monarch. Originally, this area was only accessed by joining in on a Monarch Cat Skiing trip or venturing through a backcountry access point that was located off the then named Slo-Motion ski trail. In the spring of 2005, the 130 acres of Mirkwood Basin was added to our Special Use Permit for all guests to more readily access. A 10-15 minute hike up alongside a cat track gets you there. We do encourage hikers to stay to the right side of the road as you ascend. Not only does this give room for snowcats or snowmobiles to pass safely, but it allows a solid boot-pack to form. When you can simply place your boot in a step instead of having to kick steps in as you climb, it is much easier and efficient. 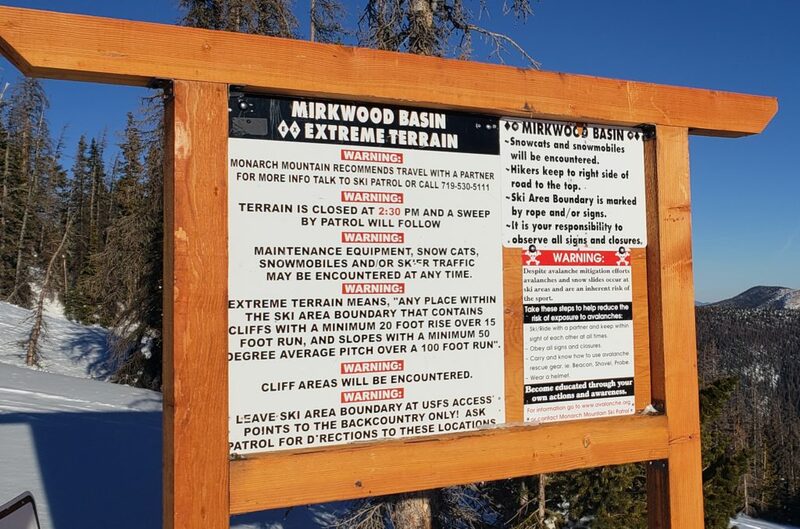 Mirkwood is serious terrain and we recommend that you ski with a partner, wear a helmet, and carry avalanche rescue gear. For more information, stop by Ski Patrol or visit our website.